In just 12 weeks, find the path to better health through this course based on the USDA Dietary Guidelines and scientific research. Form habits to help you maintain a healthier weight, stay active, and reduce your risk of chronic illness. 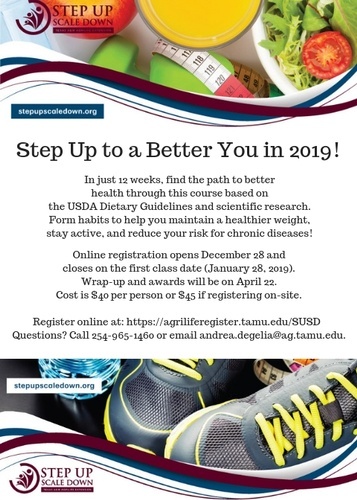 Online registration opens December 28th and closes on January 28, 2019. Wrap-up awards will be on April 22, 2019. Please visit our website for course description and schedule. Course will be offered online and in-person.